Irving, Texas is easy to reach by air from all over the world and is close to Dallas Fort Worth International Airport (DFW), one of America's largest and busiest airports. Dallas Fort Worth Airport (DFW) stands close to the city of Irving and is just a few minutes away from the city center, with many inexpensive ground transportation options available from the airport. Dallas DFW Airport features four large terminals, served by both international and domestic airlines. Irving city center is close to Dallas Fort Worth International Airport (DFW) and the city center can be reached in minutes, when traffic conditions are clear. The route to and from the airport is well signposted. Passengers at DFW Airport can travel between the large terminal buildings by using the automated train system, which also serves the parking areas and airport hotels. DFW Airport is served by a popular public bus service, traveling throughout the day from the airport's terminals into Irving, Dallas, Fort Worth and other nearby locations. Further airport bus services are operated by the Dallas Area Rapid Transport (DART). A number of hotels also now offer shuttle buses, which are free of charge. The Fort Worth Transit Authority's 'Airporter shuttle bus service is a popular transportation option, traveling to a number of nearby locations every 30 minutes. Detailed shuttle bus information can always be found on the ground transportation boards in each of the terminal buildings. 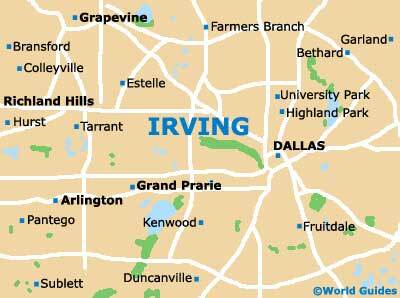 Taxis are plentiful at DFW Airport and offer one of the most convenient ways to travel into nearby Irving. Official airport taxis should always be used and the short journey to Irving is usually fairly inexpensive.